Sandy or rocky soil. Dunes, prairies and plains. Found in the Midwest and Great Plains from MI to MN and eastern MT, south to northwest IN, AR, and TX. Less eastern than C. americanus, although a few populations occur in VT, NY, and Quebec. Low growing, multi-stemmed woody shrub to 1 m. Leaves 3-veined, toothed, mostly oblong or elliptic, the larger ones less than 2 cm wide. 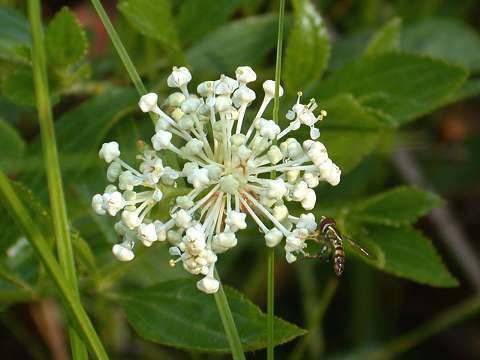 Flowers in several to many hemispheric to short-ovoid panicles, terminating leafy shoots of the season; petals 5, white. Also called Prairie Redroot. The specific epithet probably refers to the fact that the flowers occur on new wood, because the plant is not herbaceous. Endangered in several states. Of the 55 species of Ceanothus in North America, only two occur in the Northeast.